Quilting Adventures: Nothing like starting something new....! Today I thought I would give you a sneak peak at what I've been working on. Yesterday, I decided to turn my sewing machine on, it's been a while since I sewed, and work on some blocks for this new quilt I'm making. The pattern is called Blue Bird by Crab Apple Hill. I have begun hand embroidering the blocks that will be part of this quilt. I'm really proud of myself because I used left over fabrics from the Cotton Candy D'Antan quilt to make the 9 (nine) patch blocks. I am not an efficient scrap usage quilter at all. As a matter of fact, my scraps rarely gets put to good use except for the occasional applique piece and donating fabric for rag rugs, which by the way, I need to get rid of a bag of 2 1/2 inch strips. So you can see that these blocks are quite an improvement for me! Since all of my patch blocks are sewn for this quilt and what remains are the stitchery blocks, I thought I would start yet another new project. Yes, I know, but I just couldn't help myself. It's so much fun to start something new. 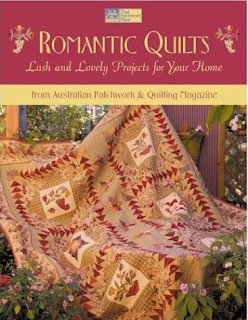 I have a list of "quilts to make", in my head ;o), from the numerous books I own. Some, I have even purchased the fabrics and this is one of those projects. The pattern is called Hearts and Bows from the book Romantic Quilts ... from Australian Patchwork & Quilting Magazine edited by Laurie Bevan. Since I do not need another hand project, I thought I would machine appliqué the blocks. Today I spent the day getting all of my fabrics together for the project. Yes, I did take a peak in my scrap bin for some fabrics, I've got to bring that heap down before it invades my sewing room. lol I also worked on refining my machine appliqué method. Oh..... and I bought a new machine appliqué foot, number 23, and I wanted to try it out! So far so good! Hi Carole, I really like the Blue Bird quilt. I have the pattern in a pile to do someday. I am going to the Quilted Crow next Sat. Is there anything that you would like? Let me know. I can't wait. These will both be beautiful, so different from each other. I love both of these. I really like the second one, I am going to do search for that book. What a lovely quilt it will be. I do like all the hand embroidered blocks within the quilt itself. I love it when I can use leftover scraps from past quilts. The Cotton Candy quilt is wonderful too. You will have quite a stash of finished tops by the time the new machine arrives. Do you also have the same problem that scraps multiply in your basket LOL I have big problems reducing my stash. Your book looks great. I clicked on your link -- ohmygosh is that blue bird ever a cute quilt! Can't wait to see it finished! My scraps just grow and grow...I don't know why...LOL I don't use many of my scraps either. Love you new projects, the blue bird quilt is so sweet. Graet blog... if ever your scraps begin to overwhelm you, feel free to toss a few my way for the scrappy foundation pieced quilt I'm doing. Such pretty little 9-patch blocks. Soft & sweet. Those are some sweet little 9 patches *s* Just keep digging in those scraps . . . you'll find some wonderful quilts in there! What an adorable and sweet quilt, Carole. I love it! Have fun! Carole, whatever you make with those little nine patches will be adorable. Nothing is sweeter than a little nine patch block!